Main theacher and president of the association. Black belt 5° dan aikikai of Italy and aikikai of Tokyo. 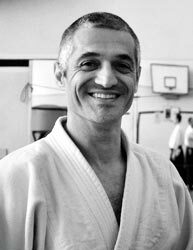 After some years of Judo, while young, moved to Aikido which he’s practicing regularly since 1985. He attended a lot of seminars (well over 100), in Italy and abroad, with many masters like Hiroshi Tada Sensei, Hideki Hosokawa Sensei, Joji Fujimoto Sensei, Kurihara Sensei, Asai Sensei and many less known (while still interesting) others. Every summer he attends the international seminars of M° Tada Hiroshi for two or three weeks. He’s been teaching for over 15 years, following methodically the teachings of Hiroshi Tada 9° dan, educational director of aikikai d’Italia. 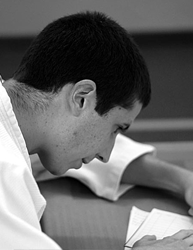 Practicing since 2006, first by following master Alvise Trevisan, then following the teachings of master Conventi. He’s long been involved in educational tasks for the association. (Italiano) il maestro Tada (多田 宏, ただ ひろし, Tada Hiroshi) nasce a Tokyo il 13 Dicembre 1929, ed è il direttore didattico dell'Aikikai d'Italia nonché 9° dan Aikikai. (Italiano) Nasce nel 1970 e ottiene la qualifica di Ente Morale nel 1978, su proposta del Ministero dei Beni Culturali.